Conwy land cup double and now plan to lock up league title | News by Wales Express News, People Before Profit! 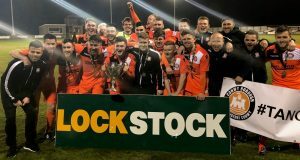 High-flying Conwy Borough completed a cup double when they added the Lock Stock Cookson Cup to their trophy cabinet with a 3-0 win over Barmouth and Dyffryn United in the final at Porthmadog. It followed on from their 4-1 FAW Welsh Trophy win against Rhos Aelwyd and with Borough in second place and right in the mix for the Lock Stock Welsh Alliance Division One title there could be more silverware on its way to the Morfa Stadium. They started the Porthmadog final as favourites against mid-table United and controlled the game but had nothing to show for their possession and pressure until the end of the first half. Tangerine dream: Lock Stock Cookson Cup-winners Conwy Borough celebrate at Porthmadog. Then Sion Hogan broke the deadlock with a close range strike after neat attacking play down the left. Borough doubled their advantage on 58 minutes when Hogan and Tommy Creamer carved open United’s defence for Dean Seager to score. United fought back hard but Borough kept them at bay and broke away after 88 minutes for Corey Williams to get the celebrations started. 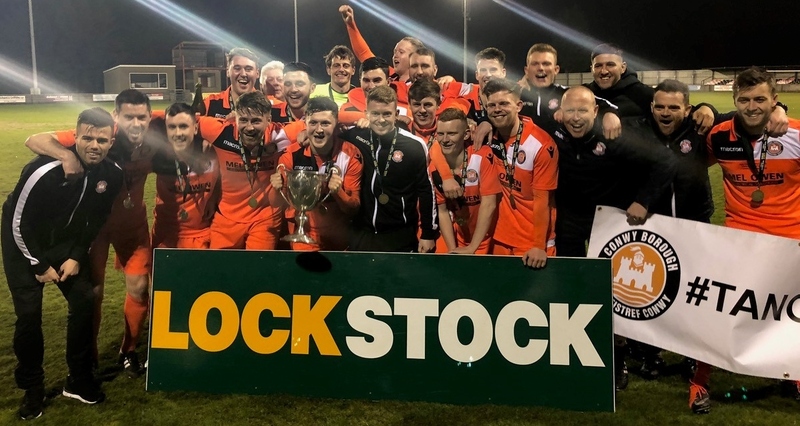 The cup was handed over by Lock Stock director Shon Powell who said: “Conwy Borough are having a fantastic season and this puts them on course for a fantastic treble. Borough boss Perry Thomas, who took over this season, said: “It’s a cup double for us so we’re really pleased. We felt like we controlled the game throughout.